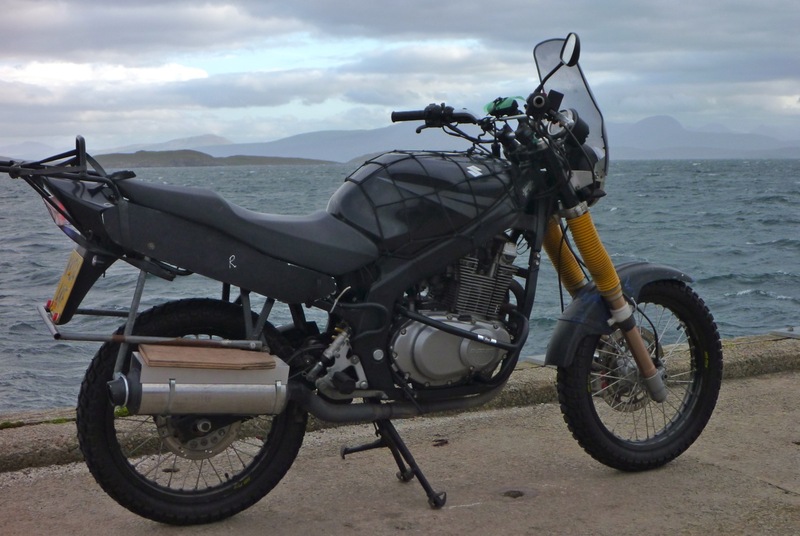 My 2004 GS runs a 2000 DR650 hub, rotor, calliper and just lately, a DR slave cylinder too, all fitted to a 19-inch Excel rim in the original swing arm. 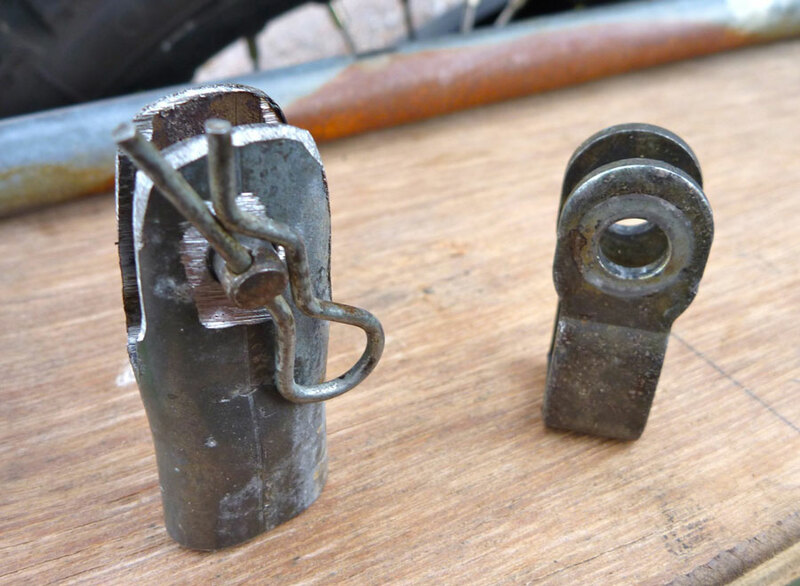 My non-bikey mechanic mate did the job, taking some suggestions from me. The DR650 spindle is thicker than the GS so the swing arm slots and the spacers inside them were enlarged to take the DR size and a high tensile bolt was used. Can’t recall if this was because a used DR spindle was hard to find, a new one too expensive or the DR axle was just the wrong length so using a bolt was easier. We considered lengthening the swing arm – apparently a DR650 will slot into the frame but is said to be rather long. Plus I thought the stresses on the already jacked up OE linkage with the SV650 shock might get too much and extending the GS5 swing arm a bit risky. But as it is, the bike handles normally within its limits. I can’t see myself skimming over the dune tops or powersliding like Gaston Rahier on his Marlboro BM. As for spacers and alignment of chain and rotor, we focussed on getting the chain lined up first (the new rim was offset to fit, I recall) and sorted the rotor after. 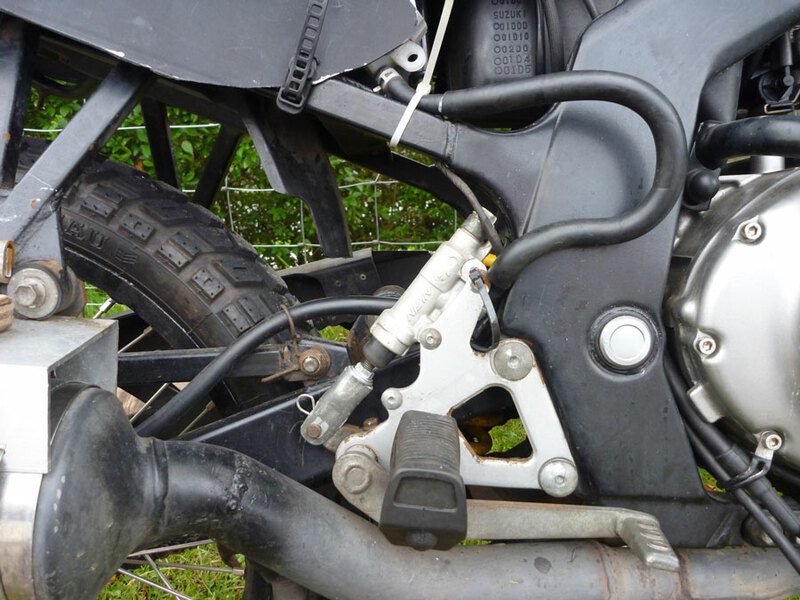 From the picture left, it looks like the OS DR spacers or a very similar tube spacer were used with just a couple of washers between the calliper and the swing arm to fill out, so it was a pretty close fit. 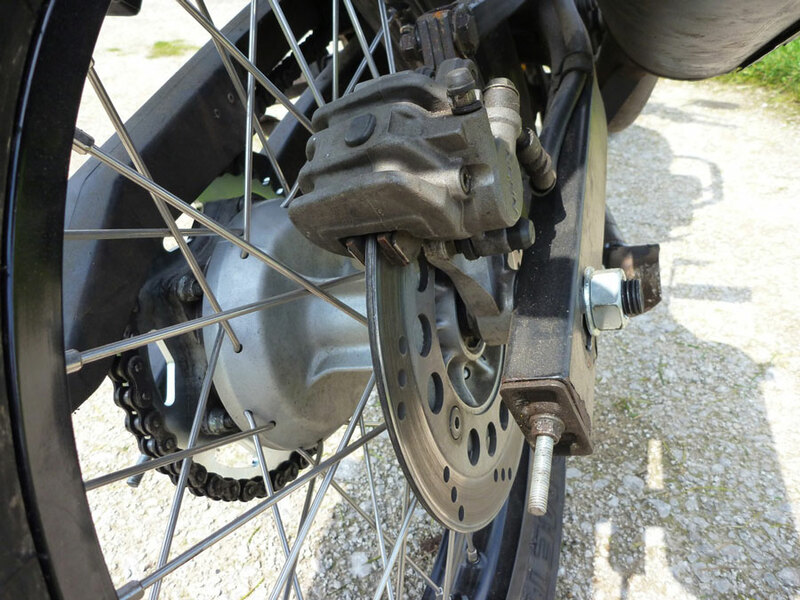 A custom sprocket was ordered to fit the DR’s sprocket carrier with a guesstimate that 42T (rather than OE 44) with the OE 16T would make the gearing near identical to the original GS500 but now with a 19-inch wheel; the guess proved spot on. The same chain is used with no length changes, but with a couple of extra links I could run the wheel at up to 1.5 inches further back to lengthen the wheelbase which is currently about 58” (as short as possible on the swing arm slots – original is 55.5″) and feels fine. 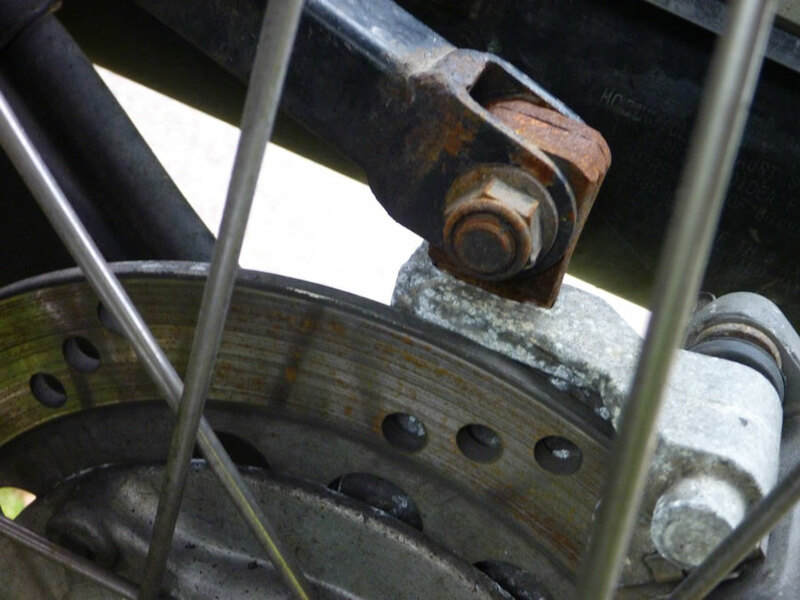 There are no chain tensioners needed, but an idler might be an idea to stop the lower run rubbing on the pad which makes a bit of noise. 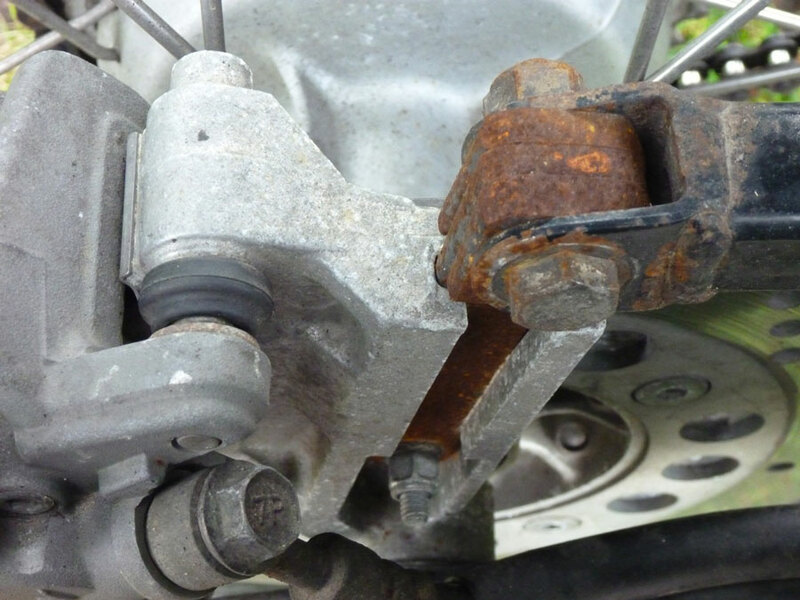 The OE GS slave cylinder didn’t work well with the DR rear calliper – mismatched hydraulic ratios meant weak braking, or so I thought. 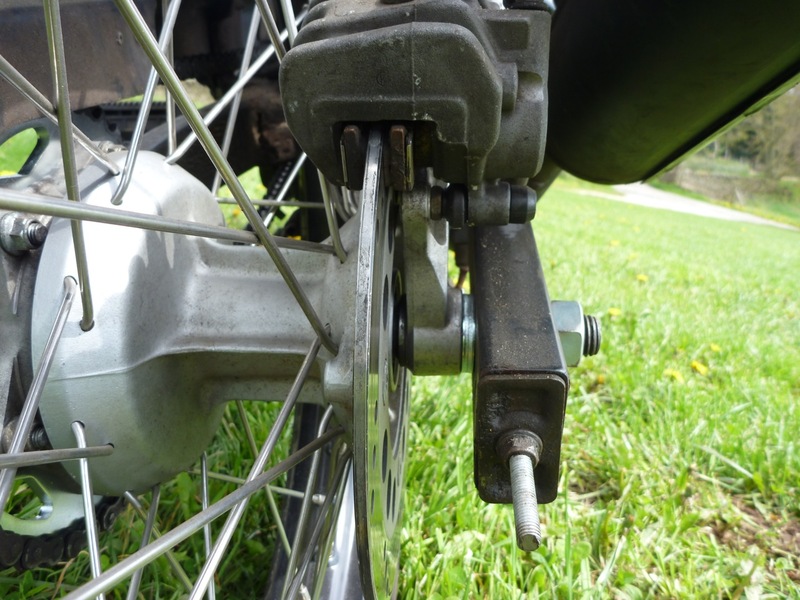 I eventually fitted a DR slave cylinder and rear braking improved to the point of being able to lock the wheel, but still requires a long throw of the pedal, even after replacing the linkage with a slightly longer item made from a bit of 3/4 inch tube (below right). I then found an image of a DR rear slave set up and the DR pedal pushes directly up on the vertical cylinder, not leaning over at 45° like mine which effectively lengthens from the throw. The GS brake pedal mounting splines are rather coarse so moving it around one notch didn’t work either. Alignment of the DR slave on the GS mounts is a bit tight anyway as it is now, but now I know the brake is working better than it was, an adaptor plate can be made to verticalise the slave cylinder so hopefully making a shorter throw and snappier brake. 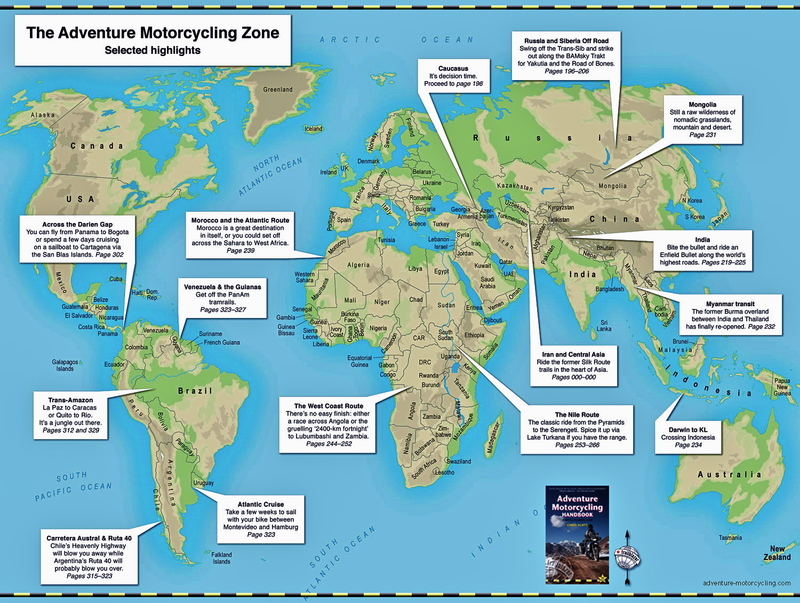 This entry was posted in Adventure Motorcycling Gear Reviews, AMH News, Suzuki GS500R Overlander and tagged Suzuki GS500, Suzuki GS500 dual sport conversion, Suzuki GS500 rear wheel conversion, Suzuki GS500R overlander. Bookmark the permalink.